Things! Which! Happened! To! Me! Had my traditional “I’m back!” lunch in the Corrib with Joshua. No more needs to be said: this is a tradition par excellence which you mess with at your peril, right down to pretending to scan the menu and then just-so-happening to have a burger. Mm. That’s right. This was the day I made my fateful discovery that Willesden Green Library Centre is currently cinema-less, the management having apparently ‘disappeared’. Hmmph. 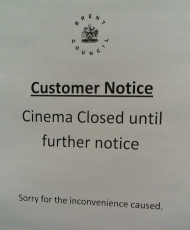 This is not acceptable: I don’t mind reading about high street closures on Nic’s blog, but depriving Willesden of a cinema means we’re now officially less cool than Rubery. Rubery! Good thing Lucy arrived on Wednesday, else I would have been tempted to storm the building and set up my own replacement finger puppet light show. Oh, it’s alright – Willesden may no longer boast a cinema, but it turns out that it does have a previously undiscovered centre for rather nice milkshakes and cake. Boo yeah – take that, Rubery Smubery. Also of note: The Emperor’s New Groove remains in the top 15% of the ‘good things of the world’ list. 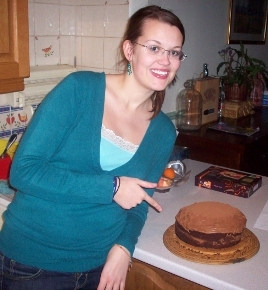 The Day Of The Great Cake Project, after Lucy wanted to do some baking and I wanted to do some chocolate cake eating. (I joke, but it should go down in the official record that this was a team effort, and there’s no Lucy-did-all-the-work in team.) Sugar-heavy cake left to cool, we then went to see Carolyn and ended up chillaxing (a word I think I use here because Tasha just walked in about 15 seconds ago) on set with the stars, as Alix prepared a showreel for an exciting audition. If only all films could have London Overground trains going by in the background, and then even bad films would become instantly lovable. Touchdown turnaround: Lucy departed for home very shortly before Sophie arrived in the neighbourhood to have dinner with the Selfs. After some tense rounds of Connect 4 and mum’s lovely cooking we headed off to Camden so that I could introduce yet-another-person to ‘mango’ beer, which was met with warm appreciation. 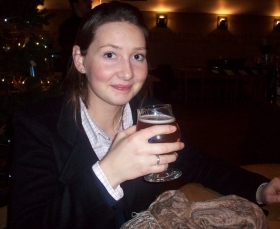 In fact, Sophie loved night-time Camden in general, and it’s always nice in general to see London through a fresh pair of eyes. It may be one cinema down, but you just wouldn’t live anywhere else, would you? I will resist starting a new cycle of the week, but just to note that I also caught up with Sanna today, who was lucky enough to catch the last of the cake before it vanished. Also: as of this morning we are down to a one solitary Windows XP machine, which will itself shortly be extinguished once mum’s shiny new laptop arrives. (Evil Laugh.) Blue may have been the colour of 2001, but it is so, so time to move on. To The Future! TV Tropes Will Ruin Your Life. But, hey, TV Tropes Will Enhance Your Life!